101 GP7 EMD - 3/1951 13351 Ex-CF&I 101; the unit was repainted and renumbered 200 for the Bi-Centennial in 1975.� 200 eventually was chop nosed, and repainted in phase 2 paint scheme, the one premiered by the GP38-2s.� She was sold to the Sidney & Lowe (NE) where she was still around, although inactive, in 2010. 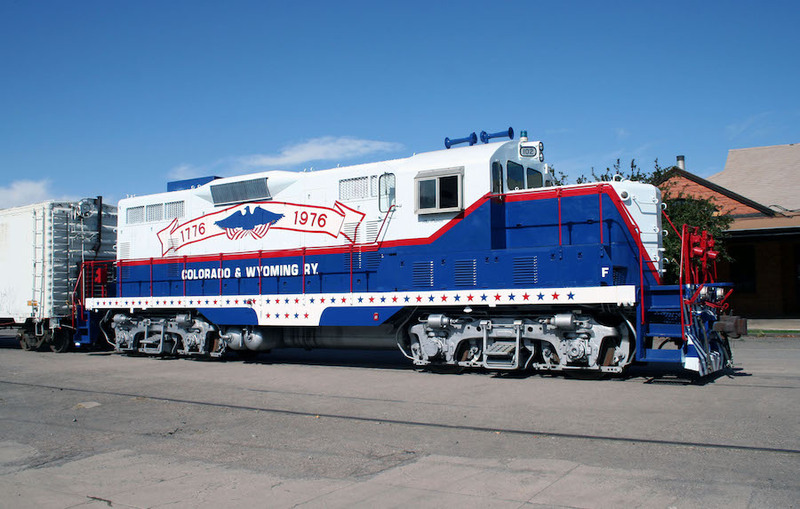 102 GP7 EMD - 3/1951 13352 Ex-CF&I 102; loco was chop nosed, may have gotten phase 2 paint, but is definitely phase three paint.� She was donated to the Pueblo Railroad Museum, who re-created the Bi-Cent paint scheme on her. 103 GP7 EMD - 12/1951 15746 Unit lacks MU capability.� Chop nosed.� May have gotten phase 2 paint, but is definitely now in phase 3 paint.� Donated to PRRM. 104 GP7 EMD - 12/1951 15747 the 104 lacks Dynamic Brakes.���Chop nosed.� May have gotten phase 2 paint, but is definitely now in phase 3 paint.� Donated to PRRM. 201 - 209 SW8 EMD - 12/51 15737-15745 201-208 started in phase one paint and most if not all got phase 2 paint and now phase three. #203 and some others were sold. 214 SW900 EMD - 5/1957 23537 214 was sold to ASARCO in Amarillo, TX in the late 70s, maybe early 80s. 1104 S2 Alco - 3/1944 70196 Ex-Denver & Rio Grande Western 116; scrapped in the late 70s. 1105 S2 Alco - 9/1943 70183 Ex-Denver & Rio Grande Western 109; scrapped in the late 70s. 2001-2002 GP38-2 EMD - 11/1973 73632-1 & 2 2001 and 2002 were sold to a leasing company, who leased them to the BN and later CORP, who had them as their 3818 and 3819 until about 2/2011. Colorado & Wyoming was a subsidiary of Colorado Fuel & Iron until 1993 when sold to Oregon Steel Mills. Some units were lettered as CF&I. Phase 1a paint is black, yellow end stripes, CF&I lettering. Phase 1c paint is the Bi-Cent scheme. Phase 2 is the Frisco style red and white shceme. Phase 3 is a solid red scheme. Thanks goes to Robert R. Harmen, DDS for a major roster expansion and update.